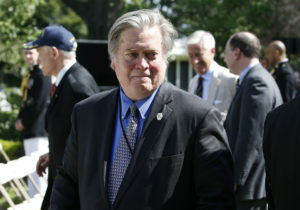 Breitbart announced Tuesday that Bannon would step down as executive chairman of the conservative news site. WATCH: Will ‘Fire and Fury’ split the Republican Party? Trump has lashed out at Bannon for comments made in an explosive new book that questions the president’s fitness for office. Bannon has tried to make amends. He issued a statement Sunday praising the president’s eldest son.